I wrote a post not too long ago about the loss of the father in the revisionist Western, and in that post, I discussed the work of Sam Peckinpah (Bring Me the Head of Alfredo Garcia) and Cormac McCarthy (No Country for Old Men). At the time, I'd seen the Coen Brothers film of No Country, but I'd been more concerned with the general narrative of that story, rather than its particular imagery... I was, after all, discussing the Western as a genre charting the loss of romantic ideals. It was all about the general thematic treatment. I didn't realize, at the time, that the connection between Peckinpah and No Country reaches much deeper into specifics. 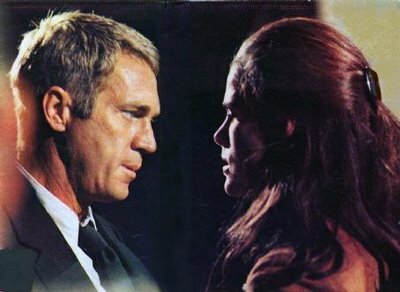 But this week I saw The Getaway as part of Renegade April, and as a follow-up to Steve McQueen’s other iconic movie, Bullitt. The visual and tonal similarities to No Country for Old Men were striking, and the movie was mesmerizing for many of the same reasons as its 2007 Oscar-winning brother: its starkness, its cynicism, the feeling of many destructive agents slowly and inevitably converging... and the power of a desperate scenario to lay bare the crisis of cruelty and vulnerability at the heart of a man's soul. 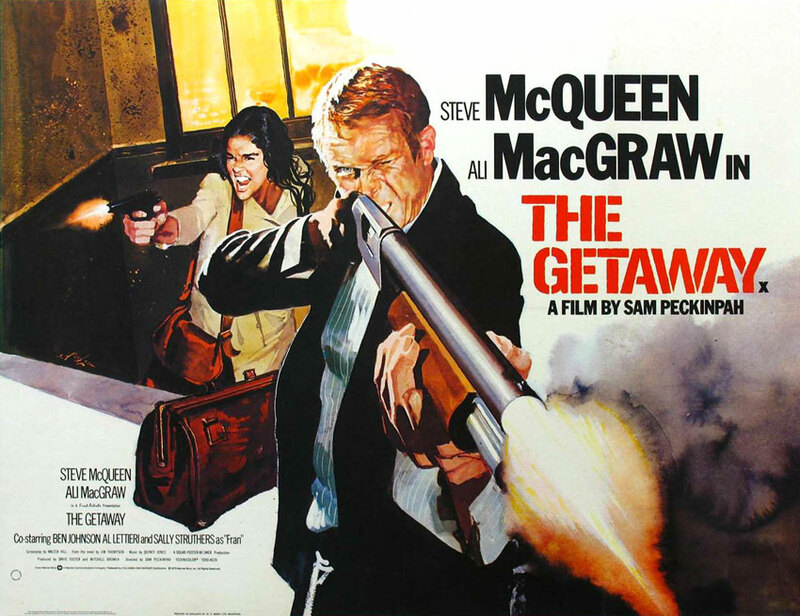 The Getaway is a film about Doc McCoy and his wife Carol, two seasoned professional criminals, who negotiate Doc's release from prison by offering to help carry out a high-stakes bank robbery in the Texas desert. The robbery goes off with some complications, but Doc and his partners are successful at procuring the money; it's only when he goes to meet his client that he discovers he's being double-crossed by one of his partners, and set up by the boss himself. Doc and Carol finally set out across Texas toward Mexico, hoping to reach safety before they're caught either by the law, by the hit squad sent to recover their loot, or by the treacherous partner who continues his vengeful pursuit. Aside from the fact that The Getaway is about a resourceful maverick carrying a pile of money and attracting a world of hostility, there are myriad other connections to No Country for Old Men. Both films have a climactic scene of pursuit and destruction in an old hotel, passing through doorways and up and down old stairs. Both films' action takes place at rest stops over a long, desperate flight through an unforgiving Texas landscape. Both films center on conflicted, heroic, but foolhardy males, carried through their trials by their love for a woman. Both films end with the wisdom received from an old local, speaking with the wisdom that comes from a lifetime of small, difficult struggles. No Country for Old Men even has a poster with the words "There are no clean getaways," which may well be a nod to Peckinpah's film. Steve McQueen's Doc is firmly in the spirit of Llewellyn Moss, the protagonist of No Country: he's a seasoned survivor with a bag of money, breathlessly fleeing an army of brutal pursuers. Like Moss, Doc is a man defined by his hardships: prison was for Doc what the Vietnam War was for Moss. Doc is also a specialist, a go-to guy for bank heists, and he's tortured by the demands of love: his wife, Carol, knows the game as well as he does, and she knows that sometimes she has to be cruel to him in order to save him. 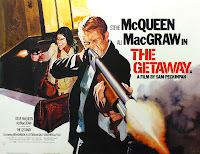 Doc and Carol's troubled relationship is among the greatest distinguishing features of The Getaway, run through as it is with tenderness and hesitation, jealousy, competition, and perverse loyalty. Doc is a double-renegade: he's on the run from the law, but he's also a pariah within his own criminal underworld, being the victim of two separate betrayals. The immediate dangers are the guns of the criminals following him, and these are frustratingly relentless, finally catching up with him in a hotel in El Paso. However, McCoy and his wife are also running from the law, a larger, more elusive enemy. Though "the law" isn't embodied in the form of a particular sheriff or detective (there's no Tom Bell to be found), it follows Doc and Carol everywhere in the form of Doc's face in newspapers and on television screens... perhaps even more unsettling than the literal faces of Rudy and the mob hitmen. Doc and Carol's greatest allies are the less informed local folk, who still see Doc as a stranger, and don't understand that he's a threat to anyone. Notwithstanding the benign cooperation of townspeople, Doc and Carol are passing through a truly damaged world. Rudy, the Mexican back-up man turned vengeful pursuer, is a lens for the world's dysfunction, revealing it by activating it. The way he destroys Fran and Harold Clinton is the hint of tragedy that sets the whole story on edge; Fran's willingness to betray her husband for Rudy is sickening, and the emasculation and humiliation of Harold is so disheartening that his eventual suicide comes almost as a relief. Rudy is a rather inept version of Anton Chigurh -- not a force of nature, but still a destructive mechanism, revealing the fragile nature of orderly arrangements by unraveling them: first the heist, and then the Clintons' marriage. In a certain way, it seems that Doc and Carol aren't fighting against the underworld per se, or even against the inescapable hand of the law, but against a world of false order, a world that's always on the verge of betrayal and abandonment. This instability manifests as deals-gone-bad, as treacherous partners, as the ubiquitous presence of the law, and as marriages and lives always ready to collapse under the pressure of danger and anxiety. Doc's survival mechanism is that he sees these double-crosses coming, time after time -- he pre-empts Rudy's attempted murder, he drives away from a drive-thru restaurant before any cops arrive, he notices the suspicious behavior of the El Paso hotel-keeper, and time and time again, he shows himself able to act ahead of his enemies, who, as it turns out, are absolutely everywhere. In this untrustworthy world, Doc's only reliable companion is his wife, Carol, and even she has to betray him in order to save him. This catch-22, the treachery at the rotten heart of The Getaway, threatens to destroy their relationship, and I think we, Doc's audience, know that this will be the end of both of them. They are, after all, two residents of a brutally hostile world, and they seem to survive for each others' sake. I would conjecture that the whole web of conflict in The Getaway is built upon this single, central tension between Doc and Carol, and that's what makes them protagonists, despite their lawlessness and their brutality. And the resolution of this central conflict is what makes The Getaway finally different from No Country for Old Men... and possibly from its source material, Jim Thompson's novel, which I understand ended differently. If Doc and Carol had abandoned one another, they would have succumbed to the nihilism of a broken universe, and the film would have been an exercise in hopelessness. This is, in a certain way, the bottom line of No Country, which is indeed an amoral tale: the unchecked destructive forces of a changing world are not going to let you off the hook. Doc and Carol, on the other hand, are able to save themselves by sticking together, and by hinging their resistance to a cruel world on the optimism of their love. And like Tom Bell in No Country For Old Men, so an old man in The Getaway sums up the implied spirit of a broken world, when he urges Doc and Carol to settle down and get married. In the Coen Brothers' wasteland of Texas, there's no mercy waiting at the end of the line... in Peckinpah and McQueen's Texas, there's hope on the horizon, as long as you fight against the throes of this destructive world.